Teaching students how to make good decisions by using a decision skill framework grounded in the decision sciences means giving them the opportunity to engage in nuanced civil discourse. This approach to engagement around difficult, divisive, and complex conversations as we strive, globally, to address complex problems is necessary. The world is changing at a rapid rate and our educational system developed in an industrial age needs to shift to 21st century learning and equip our learners with a new skill set. The Royal Bank of Canada published an article about the skills needed to be successful in this era. Becoming a life long learner and decision-making were two of the identified skills deemed important (RBC, 2018, March). Decision- making is something we do daily but often it is done without much thought. As an educator, I became curious about decision making as a skill set, so I presented my students with group decision-making opportunities; it turns out, they make decisions by voting or passively following their peers. I realized that voting as a methodology makes no use of who they are and what is important to them. Could there be a better way to teach kids how to make decisions? The OECD (2004) argues that decision-making is a core competency every child needs. Hammond et al. (1999) states that “the ability to make smart choices is a fundamental life skill” (p.2). Decision-making skills encompass all of B.C.’s Core Competencies: Thinking, Communication, and Personal and Social Awareness (British Columbia Ministry of Education, 2018). Teachers need to start thinking about the process of “how” to teach decision-making because of its importance in a diverse and globalized world. Decisions are usually made in reference to problems or choices (Fitzgerald, 2002) and there are several approaches to decision-making. One of the models used is called rational decision-making, which relies solely on data and usually has a single best outcome. However, data doesn’t always convey the whole picture; therefore, the rational model is only part of a fullsome decision-making process (Fitzgerald, 2002). Senge (2006) speaks of trying to make decisions based on solutions that have worked in the past. His experience shows that this approach often backfires. Fitzgerald (2002) talks about business managers making decisions by edict and persuasion. Although managers are commonly aware of some higher quality approaches to decision making like participation, they tend to resort to more ineffective approaches like issuing edicts. For example, participation was used in just 1 out of 5 of the 356 significant decisions included in the study. Yet 73% of decisions made with participation were fully implemented, and 80% of those decisions continued to be sustained after two years, as opposed to a mere 35% and 53% for decisions made by edict and 47% and 56% for decisions made via persuasion. Unfortunately, the latter two methods were employed 75% of the time (p.4). We all recognize that being part of decision-making opportunities as a whole staff makes for more staff engagement in and ownership of the solution or the decision, thereby improving the outcome. How can we go about making decisions that engage all perspectives? ProOACT, which stands for Problem, Objective, Alternatives, Consequences, and Trade offs is an acronym used in the value-focused framework (Hammond et al.,1999). Each one of these steps brings us to collective understanding of our interests and values. Fisher and Ury (2011) use the term interests as in, what is the interest of each party? Values may be defined as the aspect of most importance (Hammond, et al., 1999). Problem. Defining the problem is the first step for all models of decision-making (Fitzgerald, 2002). If we define the wrong problem, our outcomes are not going to be as beneficial. In the clasroom, problem-based learning can be very beneficial for students and help them develop the skill of decision-making. Barrel (2010) states that problem-based learning is thinking of a “real world” problem and helping solve it. Students must define the problem they will solve accurately. Problems are usually created by circumstances outside of our control; however, they can be turned into opportunities if we use the skill of creative thinking (Hammond, et al., 1999). This concept can be carried over to the first step in value-focused decision-making. Value focused thinking is proactive and is about creating an opportunity (Keeney, 1992). Objectives. Objectives are goals, desired outcomes or decision criteria (Fisher & Ury, 2012). The objectives in any decision making opportunity are the answers to the question: what do you really want? Having clear objectives enables agency over one’s fate by being proactive in critically thinking about desirable outcomes. Butler et. al. (2017) state that like, “21st-century learners, autonomous self-regulators not only know how to identify expectations set for them for others, but they also know how to develop and pursue their own goals, make choice’s and decisions, think and problem-solve flexibly, and chart their own pathways into the future” (p.45-46). Identifying objectives is being able to understand what is important to you or the situation. Alternatives. Engaging with the alternatives stage means coming up with creative solutions to the problem. The core competency of creative thinking is used to come up with ideas that work for all parties. Being each party will bring it’s own perspective, the ability to understand other peoples perspective is key to successful decision-making. Aoun (2017) states that cultural agility, defined as, the ability to adapt to all cultures, will be an important component of being receptive to all peoples’ ways of thinking. Within the decision-making framework, Hammond et al. (1999), states that the perfect solution never exists; however, there is usually a decision with which no one will disagree. Consequences. The process of articulating consequences relies on critical and analytical thinking (Gregory & Keeney, 2002). Every decision has positives and negatives. Making a decision means evaluating the consequences and deciding if you are able to live with the them. The last step of the process is trade-offs. This is the point in the framework where we analyze the facts (Kenney, 1992). Focussing on the facts creates a dialogue between parties, which leads to the elimination of some choices. Uncertainties and risk tolerance. The last component of this systematic approach to decision-making is considering uncertainties and risk tolerance. If uncertainties are stated, there will be no surprises. Life is filled with uncertainties, but when we calculate them into our decisions, we come to understand them better and are better able to cope with them. In defining the uncertainties, we might use probability or a number scale to give us a better perspective on the decision (Fisher & Ury, 2011). Understanding the level of risk people are willing to take when making decisions is important. At some point, the group might choose not to negotiate because the risk is too great; they will need to rethink the alternatives and arrive at another alternative (Fisher & Ury, 2011). Gregory (1991) states that decision-making is about critical thinking. The ability to weigh the pros and cons of any situation is a skill we want to foster in children. This type of thinking does not mean we teach values such as “right” from “wrong,” but rather that we teach how to critically think and determine what is important. Many of us often make decisions quickly, not based on values but on the fact we don’t want to live in ambiguity. Brocas, Carrillo, Combs, & Kodaverdian (2016) conducted a study on children from Kindergarten through fifth grade on the ability to make value based decisions. “The patterns [they] observe indicate that improved self-knowledge of preference is that ability which supports the development of value-based decision-making” (p.9). As shown by the study, the more we teach kids about values the more they will be able to make well thought out decisions. Teaching decision skills to children will give them more control of their outcomes as they forge through the countless decisions that they will encounter in their lives. With all this research in mind, how do we teach students to engage in this structured way of making decisions? Teaming up with experts in the field, Decision Scientist Robin Gregory of the University of British Columbia and Lee Falling and Graham Long, Decision Consultants at Compass Management Resources, was a key component to bringing decision making to our classrooms. These experts allowed us, a team of intermediate teachers, to grapple with how to bring this framework into our lessons so as to best empower students in building their skill set. We worked collectively to design tools we could use with our students. 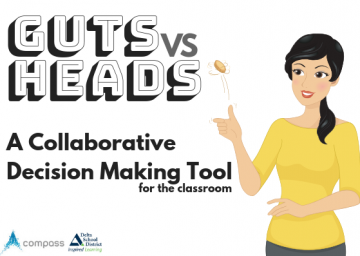 In the summer of 2018, Graham Long proposed the idea of creating a highly visual and tactile activity to engage students in the decision-making framework, an activity based on a card deck we now call Guts versus Heads. The title of the activity alludes to the tension between our first and second systems, our fast versus our slow thinking (Kahneman, 2013). With the Guts versus Heads card deck, students reason their way through these questions: What is important to me in this context (objectives)? And, what are my choices (alternatives)? What is the best solution to this problem (tradeoffs)? As a class, we use this card deck to determine the seemingly normal aspects of classroom life (seating arrangements), to how to deal with social dynamics (a bullying incident), to how we might take action as global citizens (how should we take action as a class to help refugees in our local area). With the cards, students are able to see through which choices meet their objectives. At the end of each discussion, they decide if they can “live with” the decision. We keep adding alternatives until as a class we have one we can all agree on. So far we are noticing that prior to this learning our students had only understood that they could endorse or oppose a decision. This framework enables students to find a middle ground as “accept” is also an option. Collaboratively or on their own, students are learning to slow their thinking down and move through the complexities of decsion making opportunities. Helping students see that nuanced discourse exists in the middle space between extremes is uniquely valuable. This understanding means that, if they continue with this learning, they will be able to engage in high quality discourse in public and private forums – in person or online. Learning decision skills benefits students in all areas of their lives, and for their lifetimes. Isn’t that what we want for young people? For our own futures? If you are looking for ways to introduce decision-making skills to your students, please connect with me at kvogel@deltasd.bc.ca or via twitter @kvogelvogel. I’d love to share the Guts versus Heads card deck when it is ready for wider distribution. In the meantime, I’m happy to share other resources you might find helpful. Kristen is a curious educator who brings a love of learning into her classroom. She brings a wide range of experience to her teaching. She has worked in various countries and has taught primary, intermediate, and secondary students throughout her 20 years of teaching. She is currently teaching grade 6 in the Lower Mainland. Prior to this she worked in a supportive learning classroom which came with a wide variety of students. Her various teaching roles helped her understand the importance of student centred learning and the need to teach perspective and diversity in the classroom; thus developing a passion to build students critical thinking through use of a value focused decision making framework. She holds a BA in English/Literature from Point Loma Nazarene College in San Diego, CA, and a Masters of Education from Vancouver Island University. Aoun, J. (2017). Robot-Proof: Higher Education in the Age of Artificial Intelligence. Cambridge, Massachusetts,USA: The MIT Press. Bellanca, J., & Brandt, R. (Eds.). (2010). 21st Century Skills: Rethinking How Students Learn (1st ed.). Bloomington, IN, USA: Solution Tree Press. Brocas, I., Carrillo, J.D., Combs, T.D. & Kodaverdian, N. (2016). Value-Based Decision Making: A New Developmental Paradigm. Butler, Deborah L., Schnellert, Leyton & Perry, Nancy E. (2017). Developing Self-Regulating Learners. Upper Saddle River, New Jersey: Pearson Education, Inc.
Cooperrider, D.L., Whitney, D. & Stravos, J. (2008). Appreciative Inquiry Handbook. Brunswick, Ohio, USA: Crown Custom Publishing, Inc.
Fisher, R. & Ury, W. (ed. 3) (2011). 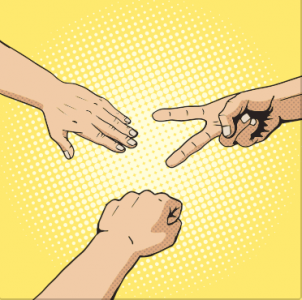 Getting to Yes: Negotiating Agreement Without Giving In. New York, New York, USA: Penguin Group. Gardner, H. (1985). The mind's new science: A history of the cognitive revolution. New York: Basic Books. Gregory, R. (1991). Critical Thinking for Environmental Health Risk Education. Health Education Quarterly, 18(3), 273-284. Gregory, R. & Keeney, R. (2002).Making Smarter Environmental Management Decisions. Journal of the American. Water Resources Association, 38(6), 1601-1612. Hammond, J.S., Keeney, R.L., & Raiffa, H (1999). Smart Choices: A Practical Guide to Making Better Decisions. Boston, Massachusetts, USA: Harvard Business School Press. Kahneman, Daniel. (2013). Thinking, Fast and Slow. Canada: Anchor Canada. Keeney, R.L. (1992). Value-Focused Thinking: A Path to Creative Decision-making. Cambridge, Massachusetts,USA: First Harvard University Press. OECD. (1999). Measuring Student Knowledge and Skills: A New Framework for Assessement. Paris, France: OECD Publishing. OECD. (2015). Educational Research and Innovation: Schooling Redesigned Toward Innovative Learning Systems. Paris, France: OECD Publishing. Senge, Peter (2006). The Fifth Discipline: The Art and Practice of the Learning Organization. Currency, NY, USA: Penguin Random House LLC.